Use the Mobile App Performance Overview dashboard to analyze data generated by mobile applications. The dashboard graphically charts the response time, visits, errors, crashes, and user actions of mobile applications over a specified time frame. Data in the dashboard is available when you integrate the Mobile Agent into your mobile apps. See Mobile UEM to learn how. 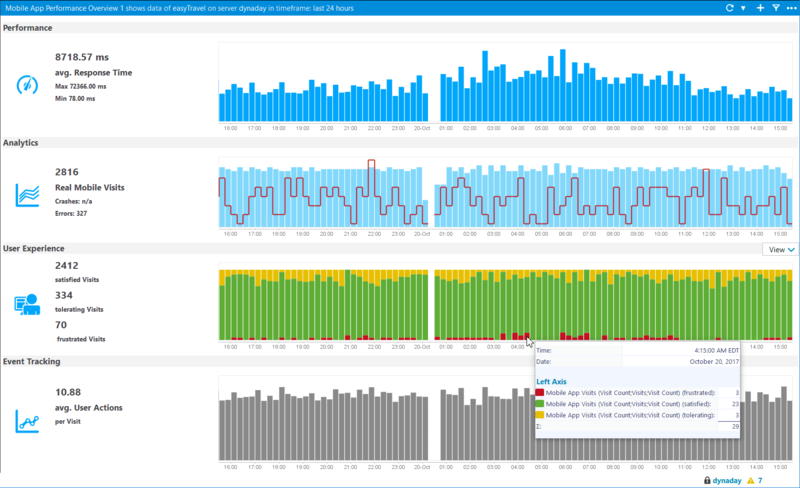 In the AppMon Client, click Dashboards > Mobile App Performance Overview to access this dashboard. You can also access this dashboard from the Start Center by clicking User Experience, then clicking the Mobile App Performance Overview text link. Charts the average response time of mobile actions for the overall selected timeframe. Additionally, maximum and minimum response times during same period display. Data points details show the average response time duration for a single time period. By default, the chart shows number of mobile visits (blue), errors in mobile actions (orange) and application errors (red). The numbers are also summarized left to the chart. This section gives you an overview about the user experience of your mobile visits. See User Experience Management for details about how user experience index is calculated. The average number of actions a visit triggers in your mobile application is visualized in this chart. Check the click path in the Visits dashlet to get a better understanding about how your application is used.